← Jugs and toppled lorries on a sunny day. 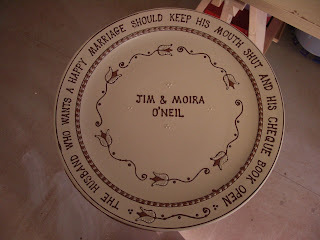 Today is just some pics of a couple of my big plates that I decorated this morning, they are for a commission. 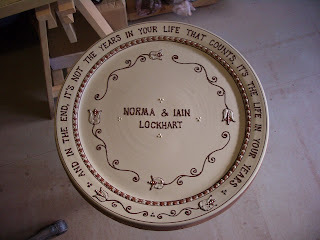 The one for Lockhart is the second attempt as on the first I so stupidly spelt the name wrong and didn’t realise until it had survived both the bisque and the glaze firings. Stupid stupid stupid girl. This entry was posted in big platters. Bookmark the permalink. 2 Responses to Todays offerings. I have wondered if you ever made such mistakes Hannah, as I know I certainly would. If you catch it in the wet state I guess you are able to carefully wipe it away and redo. ??? They look great. Yes I can change it if I realise before I fire it! I usually leave it to leather hard though and scrape it off before re-writting anything else it just tends to smear about.